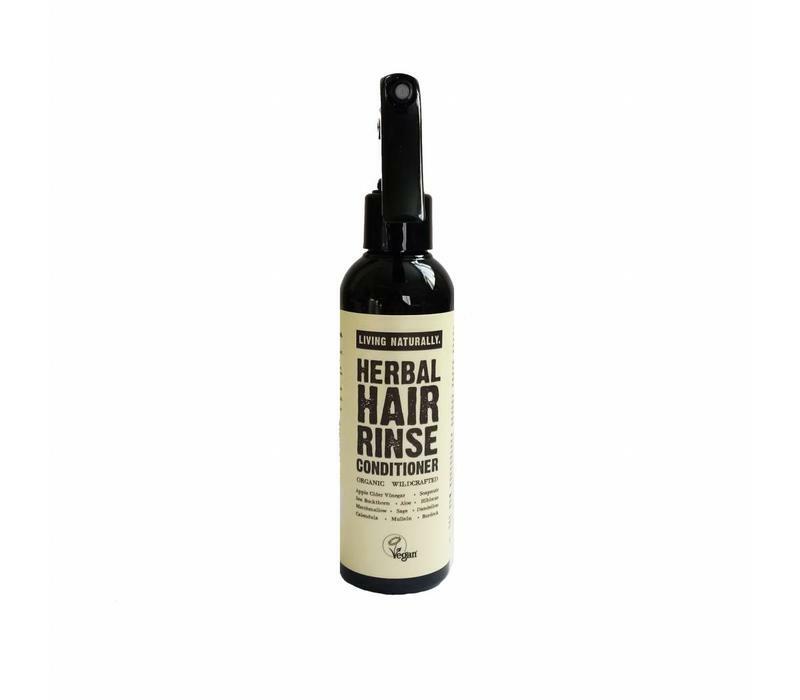 Living Naturally Organic Apple Cider Vinegar Herbal Hair Rinse Conditioner with organic soapnut liquid extract can help restore the pH of your scalp, clarifies hair, can help soothe an itchy scalp, helps relieve dandruff & can also restore shine to processed or tired hair. 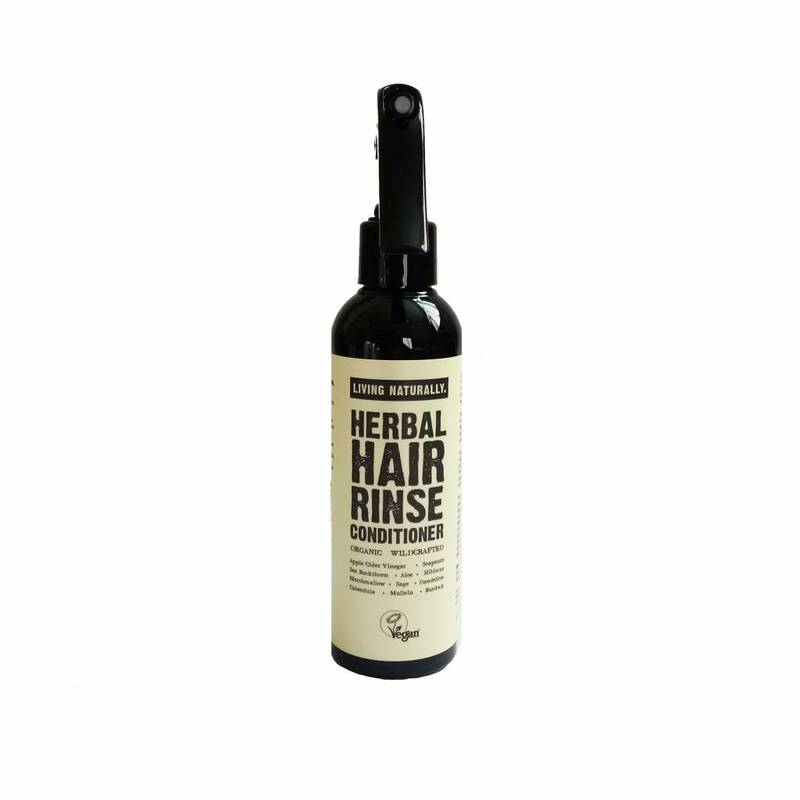 Organic Apple Cider Vinegar - in our hair rinse conditioner helps to remove any residue, and also helps to close the hair cuticles which means fewer tangles and shiny hair. It also helps promote circulation on the scalp. Organic Sea Buckthorn Oil - helps stimulate hair growth while improving the overall health of your hair, scalp, and skin. Rich in vitamins A & E which is actively involved in the rejuvenation and renewal of cell membranes, and are superior antioxidants which help to fight ageing in hair and skin - combating dryness, brittleness, thinning, and breakage. Organic Aloe Vera - is known to work wonders in promoting shine and moisture in the hair, and preventing hair loss and dandruff. Aloe vera contains enzymes that promote hair growth. The proteolytic enzymes found in aloe vera help to eradicate dead skin cells on the scalp. Aloe Vera's keratolytic action breaks down the sebum and dead scalp cells. Aloe Vera's alkalizing properties balances the pH level of the scalp and hair which results in further hair growth and retains moisture in the scalp. Organic Botanical Extracts: Soapnuts, Fenugreek, Rosemary and Nettle are great conditioners and help fight dandruff. Mullein and Birch are great for scalps, help with dandruff and gives good shine. Chamomile, Calendula, Hibiscus, Marshmallow and Licorice help soothe and condition. Herbs like Burdock, Horsetail, Sage, Dandelion, Ginseng, Soapnuts, Licorice, Marshmallow, Rosemary and Birch all promote hair growth. INGREDIENTS: Aqua, Acetum Mali* (Organic Apple Cider Vinegar), Aloe Barbadensis* (Organic Aloe Vera Juice), Betula Alba* (Organic Birch Leaf), Arctium Lappa* (Organic Burdock Root), Matricaria Recutita* (Organic Chamomile Flowers), Symphytum Officinale* (Organic Comfrey Leaf), Taraxacum Officinale* (Organic Dandelion Leaf), Eleutherococcus Senticosus* (Organic Eleutherococcus / Siberian Ginseng Root), Trigonella Foenum Graecum* (Organic Fenugreek Seed), Hibiscus Sabdariffa* (Organic Hibiscus Flower), Equisetum Arvense* (Organic Horsetail), Glycyrrhiza Glabra* (Organic Liquorice Root), Althea Officinalis* (Organic Marshmallow Root), Verbascum Thapsus* (Organic Mullein), Urtica Dioica* (Organic Nettle Leaf), Rosmarinus Officinalis* (Organic Rosemary Leaf), Salvia Officinalis* (Organic Sage Leaf), Sapindus Mukorossi* (Organic Soapnut Liquid), Hippophae Rhamnoides (Organic Sea Buckthorn Co2 Extract), Pelargonium Graveolens (Rose Geranium Essential Oil), Cananga Odorata (Ylang Ylang Essential Oil), Lavandula Augustifolia (Lavender Essential Oil), Cedrus Atlantica (Cedarwood Essential Oil), Pogostemon Cablin (Patchouli Essential Oil), Citric Acid, Benzyl Alcohol Salicylic Acid Glycerine Sorbic Acid (Eco Preservative).